Emily Cheng, of Oklahoma City, was elected Monday to be chairwoman of the Commission for Rehabilitation Services for the Oklahoma Department of Rehabilitation Services. The commission is the governing board for DRS, an agency that annually serves more than 83,400 Oklahomans with disabilities through career planning, employment, independent living, educational programs and the determination of medical eligibility for disability benefits. It is the second key move for Cheng in the last few months. She was also recently named Director of Disability Services and Diversity at Oklahoma State University – Oklahoma City. She had previously served 12 ½ years as an academic advisor and disabilities services coordinator at the school. Advocating for those with disabilities is a mission that Cheng said she had to grow into while in college. Cheng split her childhood between Chicago and Orlando, Fla. She then went on to earn a bachelor’s degree in psychology and sociology from Tulane University as well as a master’s degree in rehabilitation counseling from Louisiana State University Health Sciences Center. Both universities are located in New Orleans. After college, Cheng worked as a counselor at a nonprofit, which served those suffering from compulsive gambling. Less than two years later, she became a rehabilitation counselor for Louisiana Rehabilitation Services, that state’s DRS counterpart. Cheng and her husband, Cambre, were living in New Orleans when Hurricane Katrina hit. They moved soon afterward to Oklahoma City, where her husband had accepted a job offer. Once here, she said she began considering the idea of working in education, especially in a university setting where she herself had flourished. Now in her new role at OSU – OKC, she has the chance to help others find their inner strength and realize their dreams by helping create an environment in which they can grow. 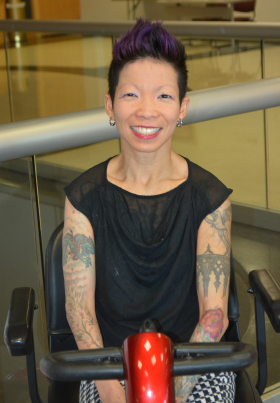 “One of the many reasons I am so excited for this position change is because it is going to allow me to really make sure the disability services we offer our students are the fullest and richest they can be,” Cheng said. “I have been tasked with being the central data point and central thought leader for diversity issues on our campus. We have to ask ourselves: How can our school encourage more nontraditional learners to come here and successfully complete a college education? Once they get here, how can they feel supported, welcomed and accepted? We also have mission to create diversity in our faculty and staff so they model some of those more diverse experiences for students,” she said. Cheng also sees her new role as chairwoman of the DRS Commission as one where she can champion the work DRS does to help Oklahomans with disabilities realize their dreams of a career and financial independence. Other members of the Commission for Rehabilitation Services include Vice Chairman Jace Wolfe of Edmond and Commissioner April Danahy of Enid.